Every city, town and village has its memorial to war. Nowhere are these more eloquent than in Australia, generations of whose young men have enlisted to fight other people’s battles – from Gallipoli and the Somme to Malaya and Vietnam. 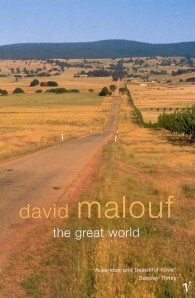 In The Great World, his finest novel yet, David Malouf gives a voice to that experience. But The Great World is more than a novel of war. Ranging over seventy years of Australian life, from Sydney’s teeming King’s Cross to the tranquil backwaters of the Hawkesbury River, it is a remarkable novel of self-knowledge and lost innocence, of survival and witness. David Malouf is the internationally acclaimed author of novels including Ransom, The Great World (winner of the Commonwealth Writers' prize and the Miles Franklin Literary Award), Remembering Babylon (shortlisted for the Booker Prize and winner of the IMPAC Dublin Literary Award), An Imaginary Life, Conversations at Curlow Creek, Dream Stuff, Every Move You Make and his autobiographical classic 12 Edmondstone Street. His Collected Stories won the 2008 Australia-Asia Literary Award. His latest book is A First Place (2014). In 2008 Malouf was the Scottish Arts' Council Muriel Spark International Fellow. He was born in 1934 and was brought up in Brisbane.